Punk Me Tender, take me, like it’s 1969 is a unique Photograph on plywood covered with epoxy resin with real exotic butterflies, and silk flowers in a Plexiglas Box Frame. This beautiful piece is signed, titled, and dated on the back with a serial number and artist’s stamp. ​​His murals show women in varied color schemes and are a sensation. 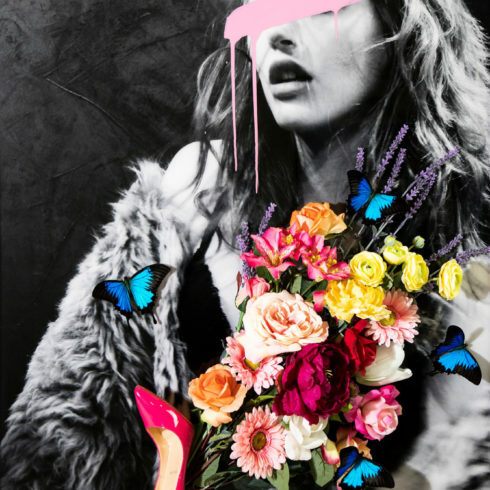 His mixed media pieces utilize black and white photography, bright splashes of pinks and blues, and incorporate real pieces of clothing. The artist maintains that a mix of graffiti and fabric is an original approach that never fails to intrigue and captivate the viewer.